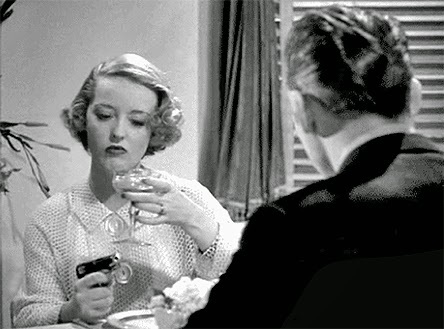 Warner Bros. Home Entertainment will have fans of Bette Davis jumping for joy — or belting out a chorus or two of Kim Carnes’ “Bette Davis Eyes” — on June 2 with the debut of not one or two, but four classic Bette Davis films on DVD. 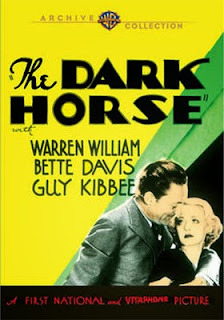 In chronological order we begin with the 1932 release of director Alfred E. Green’s comedy The Dark Horse, teaming a 24-year old Bette Davis with established leading man Warren William and Guy Kibbee. 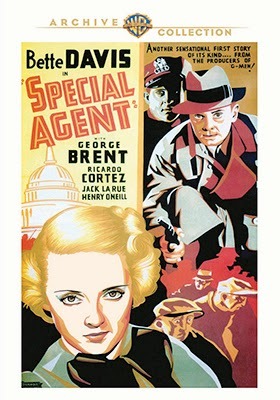 Next up is director William Keighley’s 1935 crime drama, Special Agent, which has Bette Davis as the bookkeeper for a con man named Carston (Ricardo Cortez), who agrees to help investigator Bradford (George Brent) bring him down. Her next film in 1935 was released at Christmas and that was director Alfred E. Green’s Dangerous, which won Bette Davis her first Best Actress Oscar. It was quickly followed by The Petrified Forest, which gave Humphrey Bogart his first big break in Hollywood. There is a certain irony in that … her summer film for 1936 was director William Dieterle’s Satan Met a Lady, which was a loose adaptation (and remake) of Dashiell Hammett’s “The Maltese Falcon.” The DVD release was out previously as part of a Bogart promotion (showcasing all three of The Maltese Falcon films) and is now once again available, but this time as a stand-alone Bette Davis release (of note, she plays the same character as Mary Astor played in the Bogart classic). Lastly, Warner Bros. Home Entertainment closes out this four-film Bette Davis promotion with the 1948 post-war comedy from director Bretaigne Windust, June Bride. This light-weigh comedy entry — wedged between Deception and All About Eve — teams the multi-talented Davis with Robert Montgomery. Also added to Warner Bros. Home Entertainment’s June 2 DVD release calendar is the double-disc, four-film collection titled The Eddie Cantor Goldwyn Collection. This unique selection of films from the iconic comedian includes Palmy Days (1931, with George Raft, Charles Middleton and Charlotte Greenwood), The Kid from Spain (1932, Robert Young, J. Carrol Nash and Ruth Hall), Roman Scandals (1933, with Gloria Stuart and The Goldwyn Girls) and Strike Me Pink (1936, Ethel Merman, Brian Donlevy and William Frawley). Paramount Home Media Distribution announced this past week that the Showtime Golden Globe winner for Best Television Series Drama and Best Actress (Ruth Wilson — Saving Mr. Banks, The Lone Ranger, etc. 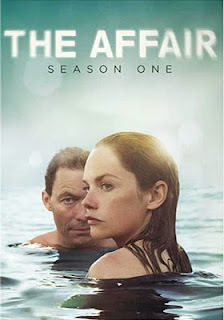 ), The Affair: Season One, will be available for fans to enjoy once again on Aug. 4. All ten episodes of this provocatively-told liaison between Alison (Ruth Wilson), a waitress working in the resort town of Montauk, and married novelist Noah Solloway (Dominic West — The Hour, Chicago, 300, etc.) will be released as a as four-disc collection. It is foreshadowed that things will not go well for newlyweds Chloe (Olivia Thirlby — Juno, Dredd, No Strings Attached, etc.) and Peter (Vincent Kartheiser — perhaps best known as Peter on the Mad Men TV series, plus such films as Alaska and Masterminds) in writer/director Scott Cohen’s Red Knot. This release from the KimStim Collection, with sales and distribution support provided by Icarus Films, is set for DVD on July 14. Filmed on location in Antarctica, with spectacular visuals provided by cinematographer Michael Simmonds — The Order of Myths, Deep Powder, The Last of Robin Hood, etc. 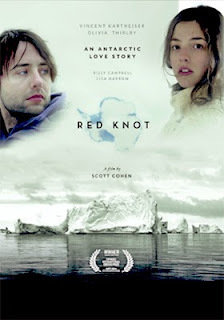 ), we are introduced to Peter and Chloe, who are just married and instead of a romantic honeymoon Peter informs his bride that they will be spending the next three weeks aboard a research vessel bound for Antarctica. How sweet is that? Guests aboard a private research vessel with noted author and biologist Roger Payne (playing himself) … a three-week tour of Antarctica aboard a passenger ship would cost the two in the neighborhood of twenty grand (or more). At first it is a fantastic adventure, complete with a cozy little cabin, and the privacy of their little ship. But soon Peter’s long interview sessions (he is working on a writing project) with Payne and his fellow researchers begins to wear on Chloe, who clearly wasn’t quite ready for the isolation of the voyage. Not only is their relationship tested, but other “distractions” not only put their marriage in jeopardy, but their lives as well. The Antarctic can be both beautiful and unforgiving. Bonus features include six deleted scenes. Cinematographer and documentary filmmaker Nickolas Dylan Rossi will see both DVD and Blu-ray editions of his latest project, Heaven Adores You, released by Eagle Rock Entertainment on July 17. This feature-length documentary showcases the life and music of the late singer, musician, songwriter and Oscar nominee for Best Music, Original Score (Good Will Hunting), Elliott Smith, who died in 2003 under mysterious circumstances. What is notable about Rossi’s film is that it contains about a dozen of Smith’s unreleased songs, who worked in collaboration with Smith’s long time friend, Kevin Moyer (who is featured in the documentary). 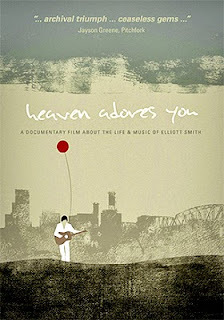 Bonus features include a performance of “Heaven Adores You” by Aaron Espinoza (Earlimart) and 60-minutes of extended interviews with many of those featured in the final theatrical cut of Heaven Adores You. 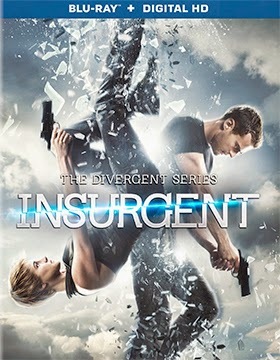 Lionsgate Home Entertainment has staked out the first week of August (Aug. 4) as the availability date for a three-SKU helping of director Robert Schwentke’s The Divergent Series: Insurgent. The ARR for that first street-date Tuesday in August works out to 137 days and the domestic box haul was an impressive $128.3 million. This second installment in Veronica Roth’s “Divergent” trilogy will be available in the home entertainment market place as a stand-alone DVD edition and two Blu-ray/DVD Combo Packs — with or without a 3D viewing option. Although released as a trio of novels, Lionsgate is breaking the third installment into two parts — Allegiant, Part 1 is due out in March of next year, while Allegiant, Part 2 is slated for release at the same time of year in 2017. Both Shailene Woodley as Tris and Theo James as Four return, however director Neil Burger has been replaced by Robert Schwentke (The Time Traveler's Wife, RED) for this outing ... he is also slated to direct the third installment in this sci-fi franchise. The Criterion Collection announced its August DVD and Blu-ray release slate this past week. It is a month full of surprises, including new film restorations and alternate cuts of well-known films. 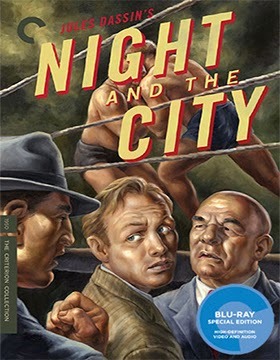 In chronological release order the release parade kicks on Aug. 4 with newly transferred Blu-ray and DVD editions of director Jules Dassin’s 1950 film noir thriller, Night and the City, starring Richard Widmark as an American in London who pulls one too many scams and ends up dead in the dreary Thames River. Gene Tierney, Herbert Lom and Mike Mazurki co-star. Bonus features include two cuts of the film — the domestic theatrical version and the English cut — vintage commentary from film scholar Glenn Erickson and more. 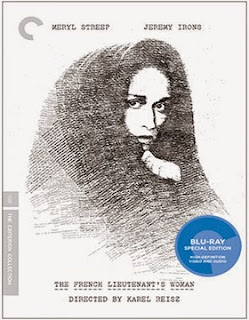 Next up on Aug. 11 is director Karel Reisz’s 1981 film release of The French Lieutenant's Woman, which was nominated for five Oscars, including Best Actress (Meryl Streep) and Best Adapted Screenplay (Harold Pinter). DVD and Blu-ray editions will be available. Bonus features for this new restoration include newly-filmed interview sessions with the film’s stars, Jeremy Irons and Meryl Streep, the film’s editor, John Bloom (Oscar nominated) and composer Carl Davis. Of note, 1981 was one of those years where the members of the Academy of Motion Pictures Arts and Sciences couldn’t get anything right. Raiders of the Lost Ark, which, by any standard, has become a screen classic, was passed over for both Best Picture and Best Director honors and Harold Pinter’s brilliant adaptation of the John Fowles novel lost out to On Golden Pond (really?)!!! Aug. 18 brings home DVD and Blu-ray editions of a newly restored 4K transfer of director Brian De Palma’s 1980 thriller, Dressed to Kill. The Criterion Collection will be releasing De Palma’s unrated cut of the film (a companion featurette details the cuts necessary to get the film down from X to R). Other bonuses include a newly prepared video sessions with Brian De Palma, Nancy Allen, the film’s producer, George Litto, composer Pino Donaggio and show-scene double Victoria Lynn Johnson (she doubled for Angie Dickinson). 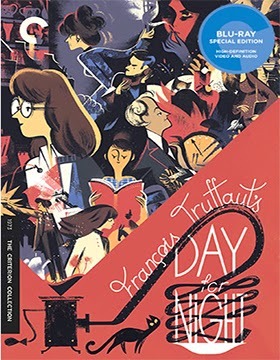 On the same date, Aug. 18, French New Wave auteur, François Truffaut’s 1973 film-about-filmmaking Oscar-winning masterpiece, Day for Night, arrives with a new 2K restoration. There are two newly prepared video sessions — one with cinematographer Pierre-William Glenn and the second with film scholar and author Professor Dudley Andrew — archival interviews with Truffaut and cast and crew members. Lastly, The Criterion Collection will debut both DVD and Blu-ray editions of Belgium filmmakers Jean-Pierre and Luc Dardenne’s Two Days, One Night on Aug. 25. This Oscar-nominee (Marion Cotillard for Best Actress) arrives with an ARR of 242 days and domestic ticket sales were a robust $1.4 million (that’s a very strong number for a foreign language import). Also included with the release is the 1979 documentary from the Dardennes, Léon M.’s Boat Went Down the Meuse for the First Time.